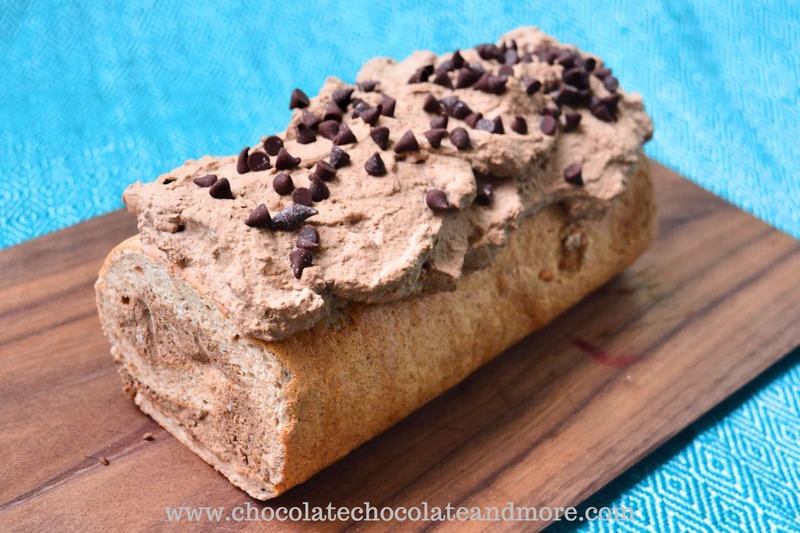 Chai Spice Chocolate Cream Cake Roll - Chocolate Chocolate and More! 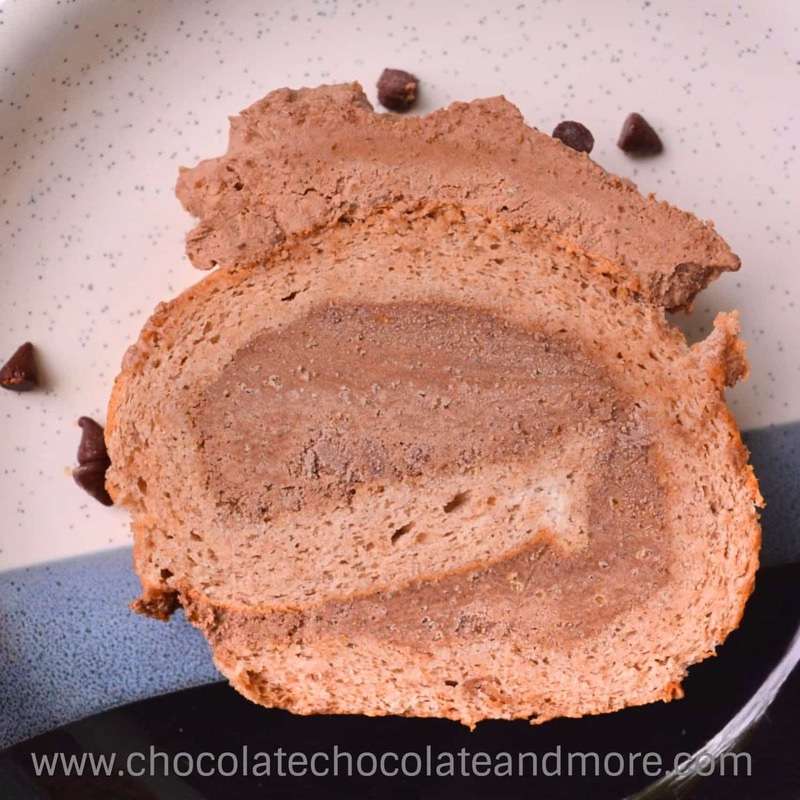 Chai Spice Chocolate Cream Cake Roll – spiced angel food cake filled with chocolate whipped cream makes for a wonderful light summer dessert or coffee treat. Some of you are probably thinking roll cakes are intimidating. 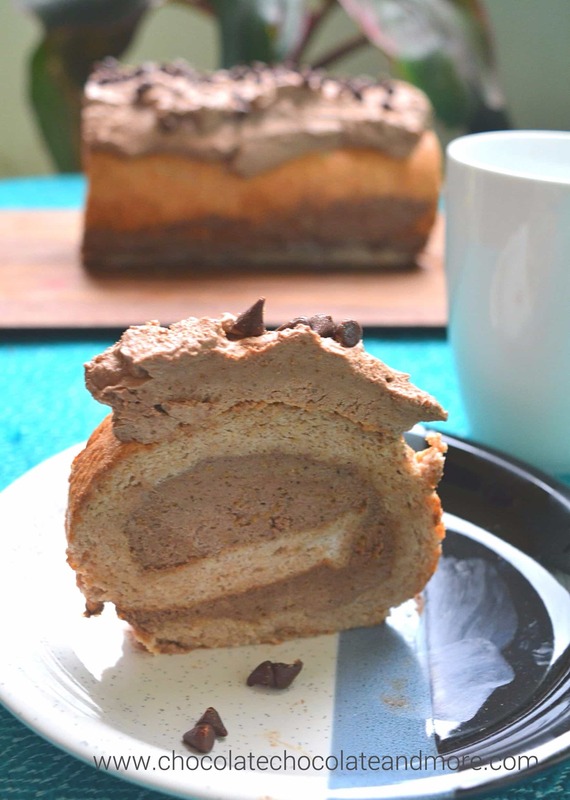 Chai Spice Chocolate Cream Cake Roll starts with a flexible angel food base. Think how springy angel food cake is. If you pour the same batter into a small jelly roll pan, you will get the same flexible springy cake in rectangular form. I made this cake in a smaller jelly roll pan (9″ x 13″) to make it even easier to handle. If you have a larger jelly roll pan (18″ x 26″), just double the recipe. The cake will be just as flexible and easy to work with. The trick for easy removal is to line the bottom of the pan and two sides with parchment or waxed paper. I cut a 15″ long by 9″ wide piece of parchment paper. This makes it long enough to hang over the ends but doesn’t cover the long sides. This lets the cake stick to the long sides of the pan to rise but the parchment on the ends gives you something to remove the cake with. I grease the top of the parchment (but not the sides of the pan) with a little cooking oil to help it release a little more easily but it’s probably not necessary. When the cake is done, just slide a knife along the long side of the pan, dust the top with powdered sugar and turn over. It will pop right out. If it doesn’t, you can gently pull on the parchment paper ends to remove it. Then gently peel away the parchment. If you’re working in a hot kitchen like I am, it is very important to chill everything thoroughly. There’s no air conditioning in my kitchen so it’s 90° F. Making everything as cold as possible first ensures the cream whips up before it warms up. If you’re in a hot kitchen and don’t chill the bowl, beaters and ingredients, you’ll have soup instead of whipped cream. I put all the ingredients together in the bowl first (cream, softened gelatin, cocoa, powdered sugar and chocolate extract). Then I put the bowl and beaters in the refrigerator while I made the cake. I pulled the bowl out while the cake cooled and then worked quickly. The gelatin stabilizes the whipped cream so you can keep this cake in the refrigerator for several days. It also doesn’t melt quite so quickly when you serve it (fresh whipped cream dissolves quickly in the heat). The beauty of this thin cake is it bakes fast (15 minutes) and cools fast (about 10 minutes). If you put your filling ingredients together and refrigerate before making the cake, you can have a cake that’s ready to go in less than an hour. 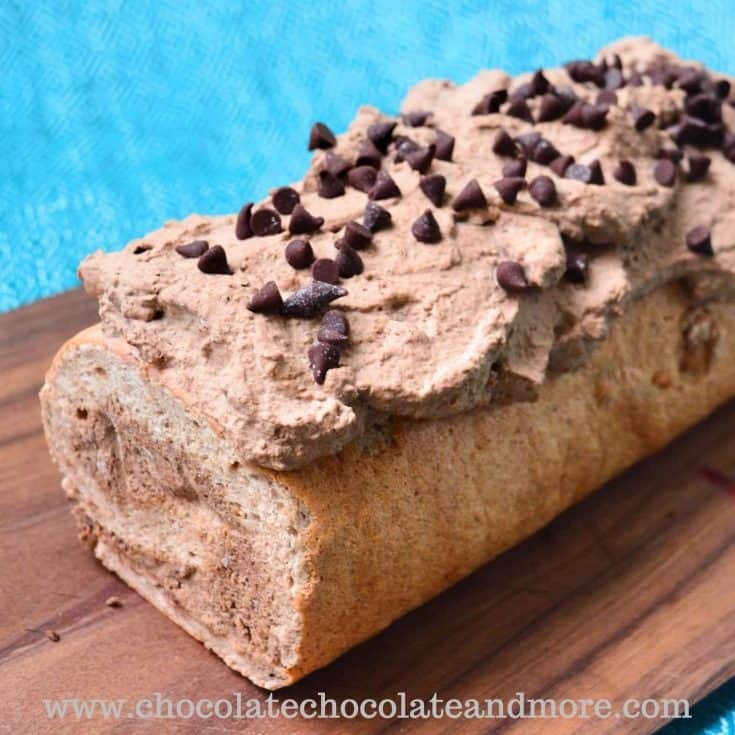 Chai spice chocolate cream cake roll also freezes well so you can make it ahead of time and save for a later date. I froze mine on a tray and then wrapped it in aluminum foil after it was solid. In a large mixing bowl, mix gelatin in cold water. Add whipping cream and chocolate extract. Sift in cocoa powder and powdered sugar and stir to mix. Place bowl and beaters in the refrigerator until well chilled. Beat on high until stiff peaks form. Refrigerate until ready to use. Prepare a quarter sheet jelly roll pan (9" x 13") by greasing the bottom but not sides with cooking oil. Line the bottom of the pan with a 9" x 15" sheet of parchment paper and grease the top of the parchment but not the sides of the pan. 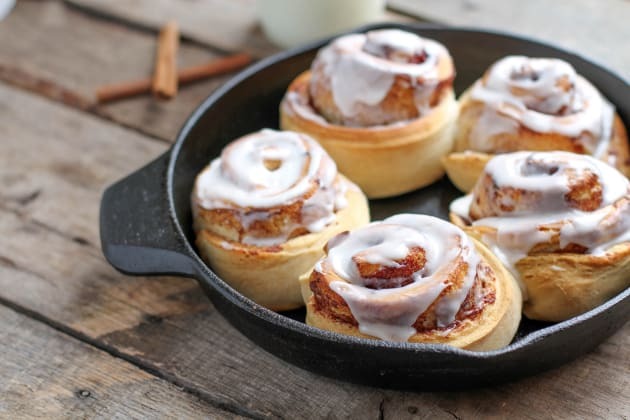 The parchment paper hangs a little over the ends of the pan but does not cover the long sides. The ungreased sides give the cake something to grab onto while it rises but the parchment at the ends makes it easy to remove the cake after baking. Set aside. Sift flour, 2 tablespoons sugar and spices together. Set aside. Place egg whites and water in a large bowl and beat until frothy. Add cream of tartar and beat until soft peaks form. Add vanilla. Gradually beat in sugar 1 tablespoon at a time until stiff but not dry peaks form. Gently sift about ¼ of the flour mixture onto the egg whites and fold in gently with a spatula. Repeat until all the flour is incorporated. Spread batter evenly in prepared pan being careful not to deflate it too much. I poured it in a line in the middle of the pan and spread out from the center to the edges. Bake for 15 minutes. Top should be just golden and springy to the touch. Use a sharp knife to loosen edges of cake. Dust top with powdered sugar and lay another piece of parchment on top. Invert to remove from pan. Carefully peel off the parchment that is on top and discard. Let the cake cool until lukewarm (this only took about 10 minutes). While the cake is cooling, remove the bowl with the chocolate whipped cream ingredients from the refrigerator and beat the whipped cream until stiff peaks form. Spread 2/3 of the chocolate whipped cream over the top of the cake. Leave about an inch un-iced on one side of the cake. You will roll the cake towards that side and the whipped cream will spread into that space as you roll. Roll the cake into a log. I gently folded one edge over with my fingers and then pulled up on the parchment paper under the cake to roll it along. Unroll, the parchment, and top with remaining chocolate whipped cream. If desired, sprinkle some mini chocolate chips or chocolate shavings on top. Double the ingredients for a half sheet jelly roll pan (18" x 26"). The baking time should still be 15-20 minutes because the cake is the same thickness. If you want a tighter spiral, you can do the following trick after you roll the cake. Fold the parchment paper over the top of the cake so that it makes a u-shape around one side (parchment under the cake, around one side and over the top). Place a ruler on the top parchment sheet and bring the ruler down along the edge of the cake. If you look from the side, you should see the spiral and the cake is now circled by parchment paper. Reach under the top parchment and ruler and grab the bottom parchment paper. While gently pushing the ruler in on the top parchment, pull on the bottom one. This tightens the spiral. I love the angel food cake base for this, Gail! I’ve always made a whole-egg sponge, but I bet using only whites keeps those chai flavors popping! Thanks for including my coffee cake in your post. That thing is excellent with coffee! Thanks for stopping by Jenni. Your coffee cake is amazing with tea too. I like that the angelfood base in this is a little lighter for summer and it’s so springy, it’s really easy to roll.